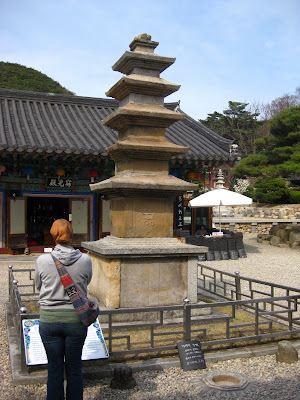 Anyway, the temple was great, though we went on an adventurous detour in order to get there. After taking a taxi to a recommended bus station, which informed us that they didn't sell tickets to Bogyung, we ambled down the street hoping for a sign. 20 minutes and several go-go girls later (I'll save that for another post) we found the sign we were looking for - Bus #500, which was headed in Bogyung's general direction. We hopped on and shoved a wad of cash into the money slot - twice as much as required, it turns out. The Korean man in the front seat on the bus informed us of this fact in perfect English. Even more luckily, the man with the perfect English was heading to Bogyung temple as well, camera in hand. As it turns out, he had lived in LA for 18 years before moving back to Korea for the last 14. 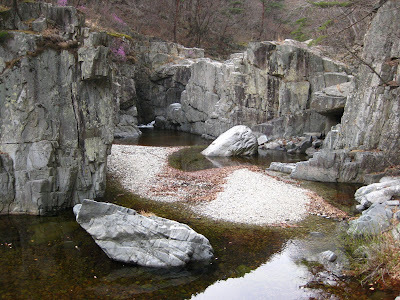 He now lives on Ulleung-do, a small and remote island far off the East coast, where he is working on his second novel (in Korean, I was admittedly disappointed to learn). He proved invaluable to our excursion. Not only did he help us and another couple to arrange a taxi to Bogyung from the bus transfer point when we discovered that the connecting bus wouldn't arrive for another hour, he also informed us that the last bus leaving Bogyung for Pohang would depart at 5:45 pm and waited, later that evening, to make sure that it didn't take off without us. 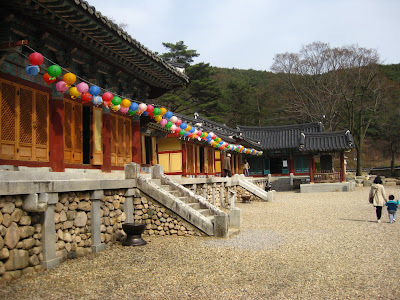 Bogyung-sa was a very beautiful and tranquil place, vibrant and alive at the same time. 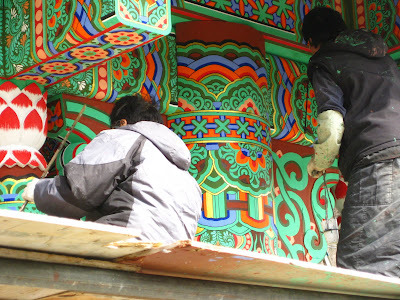 Some painters were renovating the pagodas on the temple grounds, restoring the faded colors to their original brilliant luster, and the rainbows of lanterns were strung up along the awnings of the temple buildings gave the place a festive feel. The pebbles and coarse stone that covered the temple grounds crunched underfoot as we strolled between the buildings. They were definitely an effective tool for use in increasing an awareness of the present. I was acutely aware of the peaceful silence that was broken with every grinding step. 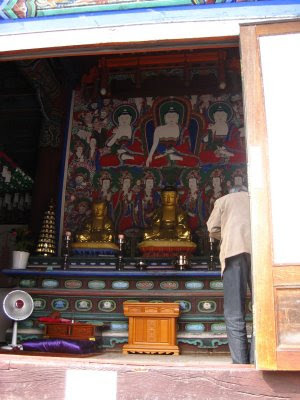 A large golden buddha sat in the main temple hall. A man entered as I stood by the door, took off his hat, and knelt, bowed, and stood several times. I wandered away before he was finished prostrating before the buddha. Idol worship - whether bowing before a golden statue of a buddha or praying to an image of christ on a cross - never really did much for me. In fact, as drawn as I am to buddhist beliefs, the pomp and circumstance of this religion really get in the way of my complete embrace. Rituals and traditions whose actual, metaphysical purpose is subsumed under an icon of the belief. It is the existence of these now meaningless rites that define religion for me now, and turn me off of it. Ironically, it was the freedom from this debasement that first turned me on to buddhism (with a small B). At the 10-day Vipassana retreat I attended in Kenya, the message was immaterial, non-denominational, universal and simultaneously intensely personal. It was a message of the interconnectedness of the world, of the impermanence of everything, of compassion and understanding. All of the retreat staff were 100% volunteer, including the instructor, who was flown in from India. The retreat itself was run by donation only - you were asked to contribute based on its worth to you, and completely anonymously. Only those who had experienced at least a 10-day retreat are allowed to donate to the worldwide Vipassana organization. The spread of the meditation technique - which is all it is; it does not profess itself as a 'religion' or anything else - is not dependent on guilt or the threat of suffering. It is about experiencing - not just reading or praying or thinking about - the truth directly, and the truth, undoubtedly and inevitably, setting you free. 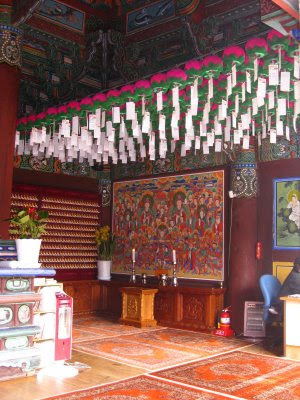 Aside from the man bowing to a golden statue, and the donation table at which you could pay for a prayer to be attached to one of the temple lanterns, I loved everything about the place. 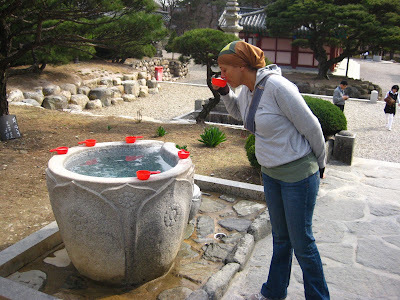 We marveled at the 1,000-year old 15-foot tall stone pagoda behind the main temple building and drank the crystal clear water from a communal stone basin. Afterward we walked along a hiking trail running between the temple and a rocky creek. 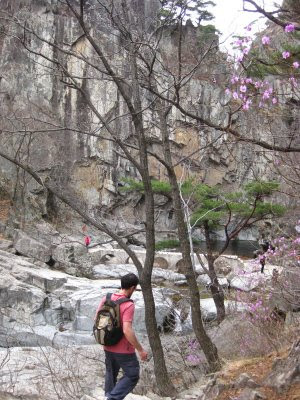 Dozens of Koreans were out in full backpacking gear, trekking poles and all, even though the trail was often comprised of wooden steps and wheelchair ramps. 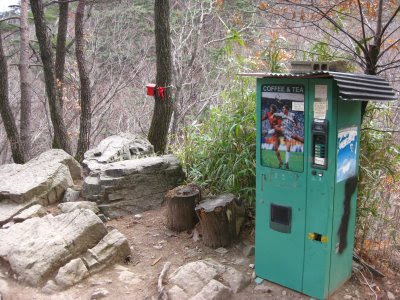 The hike was steep in parts, though, and after one particularly tough incline we found a coffee vending machine at the crest of the hill, a reward for the effort, I suppose. I treated myself to a cup of Americano. We hiked til we reached the last waterfall within an hour's hike. The trail forked immediately before the waterfall, and the path to the left continued for several more miles to the peak of a distant hill. The path on the right led to a bridge. 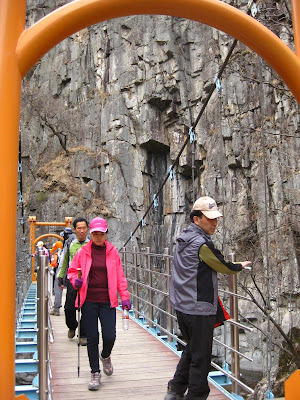 The bridge, an egregiously large, orange suspension bridge that looked as if it were built to support a tank load, led to Yeonsan Waterfall. The waterfall was, unfortunatly, so unimpressive that I forgot even to take a picture of it, and instead took this picture of one of the Chinese characters carved into the rock wall, which I found infinitely more interesting. On the hike back, we ambled through the small tourist village at the temple foothills. We passed by the shops selling small buddhist treasures, homemade tofu, and handmade clay pots, finally making a purchase that should in no way be considered influenced by our visit to the temple, and which, in hindsight, might never be called a good investment. But it will make a great conversation piece. 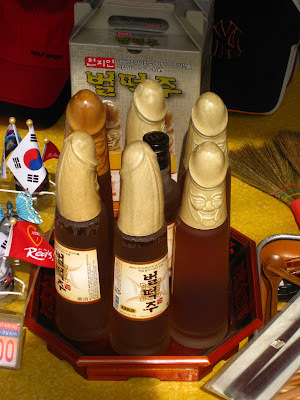 Those 벌떡주 bottles will certainly make for an interesting conversation starter! Have you tasted any of them yet? 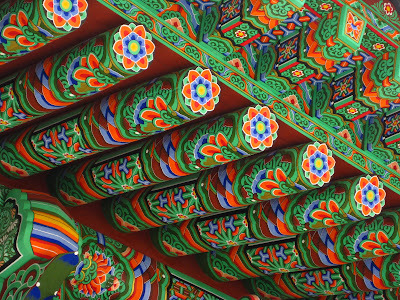 My apologies if you mentioned this recently and I missed it, but where in Korea are you located? The temple looks like a nice place for a weekend visit and I was glad to hear that you had someone willing to help make sure you got on the bus going back home! 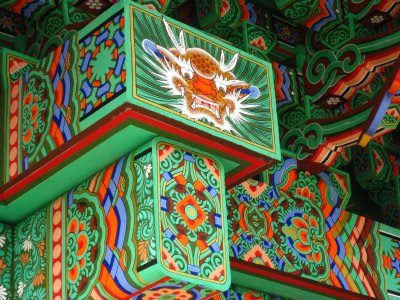 I had a similar experience going out to the Hampyeong Chrysanthemum Festival and really appreciate the effort made by strangers here to help out those who may need it. 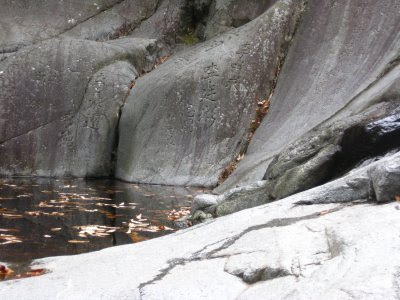 Interesting Hanja (Chinese characters) on the rock. 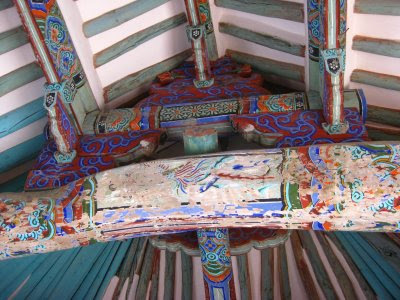 李 is the family name 'Lee', so I wonder how many of the carvings are names. By the way, I just noticed tonight that you read my blog and added a link back to yours!